My last trip to the US was supposed to start slow and easy, with a relaxing drive through Wisconsin, before reaching Upper Michigan, my intended main destination. However it turned out to be anything but a slow start. The fun begun right at Chicago’s O’Hare airport. As usual during my travels in America I made the car rental agency desk my first point of call. I had reservation for the usual full size car as I never rent anything small here. I know, I know, I travel alone you say, I could take something small and environmentally friendly. But what’s the point? I don’t travel to America to save the planet. 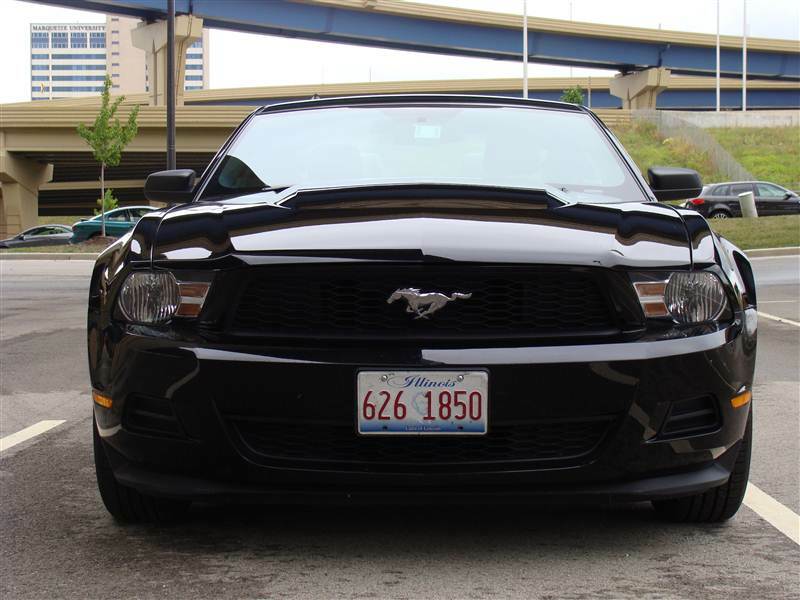 Anyway, I couldn’t believe my luck when the agent asked me if I would like to upgrade to Ford Mustang for a small fee. You must be kidding me, of course I wanted to. In fact I tried to reserve the Mustang a couple of times before, and always got an answer that they were sold out. So you can imagine my surprise at the fact they had so many of them available that they even asked what colour I would like. Red or black. Brilliant. Just for the records, I chose the black one. Driving a Mustang is fun. First it is one of America’s icons. Second, it is a fast car which handles surprisingly well (unlike some other American cars), and of course it looks great and sounds even better. In other words, it is a one damn piece of a mean machine and I loved it. After few days in Chicago (about which I’ll write another time) it was time to head north. At last! Out there, on the open highways out of town, it was the natural environment for the Mustang. As I wrote before, car culture is an important part of America and one of the aspects why I like travelling there so much. So you can imagine how much fun I had driving Ford Mustang on the quiet rural roads. Even stopping for the red lights was fun. Well, to be precise, accelerating when the lights turned green was fun. Some of the roads I chose were so small and unimportant that I really had to use my detailed state atlas to find my way. Now, before you even ask, I don’t use the satellite navigation. It makes people dumb and you never know what interesting you might miss nearby. Besides, I am a map geek. My first real stop in Wisconsin was the city of Milwaukee. That’s where another great American icon was born and is still produced up to today. I am of course referring to the legendary Harley Davidson motorbike. I guess (and hope) I don’t have to explain how big a brand it is. In fact it’s not just a brand, it is more of a religion for some. Well, maybe not a religion but definitely a symbol of America. 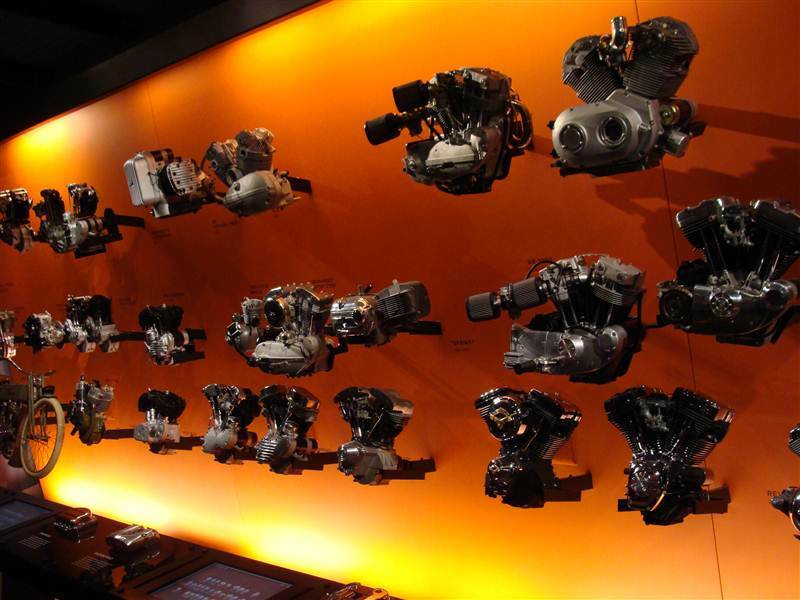 Even if I don’t belong to really crazy or devoted fans (in fact I can’t even ride a motorbike….yet), I still decided to visit The Harley Davidson Museum. This modern (opened in 2008) museum is located in a former industrial area just south of downtown. The simple but elegant building resembles more of a factory or a warehouse rather than swanky museum, but I think it is actually a good thing. It corresponds with the blue collar origin of the company and also lets the exhibition to be more important than the architecture. You realize it can’t be the usual attraction as soon as you see that the parking for the motorbikes is twice as large as the one for cars. Also, if you arrive on a four wheels you have to park further away from the entrance than bikers. I guess for some people it must be more like a shrine than a museum. But it is still a great, well designed and informative place. Among the many exhibits there is the oldest surviving Harley Davidson bike. There are in fact hundreds of Harleys of different ages, in all shapes and colours, including replicas of the ones from the movie Easy Rider (originals were destroyed during filming), as well as the “Fat Boy”, motorbike. Arnold Schwarzenegger rode one of these great sounding machines in the Terminator II movie and it is probably my favourite Harley. There is a gallery focusing on the Harley Davidson in popular culture, as well as the one focusing on the history of the company and its designs. In my opinion, one of the most interesting (and fun) parts of the museum is the engine room. Various classic engines are displayed on a big wall and you can listen to the sound of most of them using touch screens. And what a sound they make. Deep, strong and rough, for some better than most music. The best photo opportunity comes right at the end of the tour when in a big room you can sit on one of a dozen or so motorbikes fixed to the floor. Also while there you can watch short films from some of the best drives in America. It is a great room to just sit down, think and dream. Overall the museum is a great place to learn about Harley Davidson and how big a role it plays in American culture. Milwaukee itself is an usual mid sized American city. I’m sure it is a nice place to live but to be honest I didn’t find it particularly exciting or interesting. So after a short walk around downtown I hit the road and headed north again. My next destination was Green Bay, home to another iconic American institution. 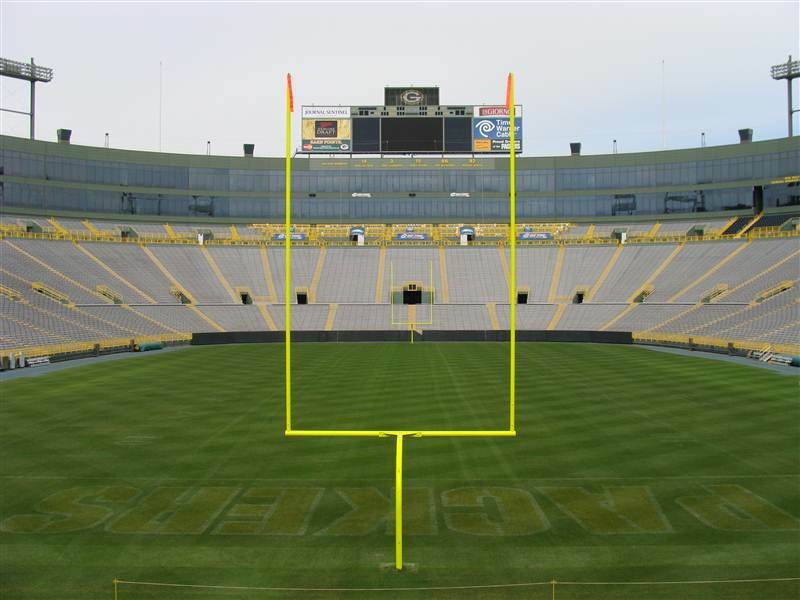 The Green Bay Packers football team. Now, just to clarify, I mean American football not normal football which Americans, rather confusingly, call soccer. Most people outside America have very little knowledge of this sport. The rules look complex at the first glance and a usual game has plenty of commercial breaks. But once you learn the rules and start watching you can quickly realize it is in fact a fast paced and very entertaining game. I myself learned the rules from Wikipedia couple of years ago just to be able to watch the Super Bowl (broadcasted in Britain by the BBC) and gradually become a fan of the Green Bay Packers. Green Bay is a rather sleepy mid sized American city and most people (including many Americans) would probably never have heard about it if not for its legendary football team. It is the only major American sport team owned by the public. It has around 110 – 120 thousands shareholders and no one can own majority of the shares. Due to its statute the club has to stay in the Green Bay and shareholders don’t even get privileges in obtaining tickets. Its structure must be one of the reasons why the club has developed such a large base of dedicated followers even though it is located in such a small and unremarkable place. In fact due to its popularity it is virtually impossible to get season tickets. There are at the moment over 80 thousands people on the waiting list and with the current rate of annual turnaround you would have to wait more than 900 years to get hold of the season ticket. 900 hundred years!!! Can you believe it? During my visit I met a person who inherited his ticket from his dad and the ticket is in family hands for over 50 years. Apparently it’s common to pass tickets to your children or to put a newly born on the waiting list. Totally crazy. Apart from its interesting structure it is still one of the most successful teams in history as well as current champion of the NFL. So while travelling around this part of Wisconsin I simply had to visit the Lambeau Filed, home to the Packers. Opened in 1957 and modernized many times since then it is a 73 thousands seat modern stadium which still has plenty of character. First, it doesn’t have even a partial roof. You might say it’s nothing special but consider that NFL season starts in October and ends with Super Bowl final in February. That means games in the middle of the harsh Wisconsin winter. It must be a remarkable sight, to see 73 thousands people cheering their team in a heavy snowfall or freezing temperatures, or both. Second, there are no comfy plastic seats, just hard aluminium benches. The guide told us it is simply to increase the capacity. Yes, the Lambeau Field is definitely not a place for softies. One of the best parts of the stadium tour is when you walk through the dark, undecorated, concrete tunnel which the home players use to enter the field. In that moment hidden speakers let you hear the roar of 73 thousands fans which greet players during every game. Believe me it is a damn amazing feeling, even if you know you are entering an empty stadium in reality. There is also a huge fan shop where you can buy all the possible gadgets associated with the Packers. Clothing (for people or pets), mugs, magnets, books, flags, even a tooth brush or a shower curtain, truly amazing choice. Outside the Lambeau Field devotion to the team is visible all over the town. Lamp posts and traffic lights are all decorated with tiny football helmets and many streets have names of the famous past players and coaches. Team flags hang outside many of the houses and stickers decorate the cars. I have never before seen such a connection between a sports team and community. Definitely not in America There is even a plastic dinosaur wearing the Packers colours outside of the local gas station. Crazy. From Green Bay I headed north again. To fully use my Mustang potential I chose the state highway 55 instead of some other major roads. I have to admit that being a map and road infrastructure geek, I did my research and knew beforehand what to expect. I even made sure it wasn’t a state-designated truck route with STAA authorized dimensions. Also, like most of the local highways, it was not really heavily patrolled by the highway police. The road was narrow, empty and crossing a nicely undulating landscape, in other words, a classic American drive and perfect territory to drive fast. At this moment it’s probably wise to shut up and skip the details so as not to incriminate myself. All I can say, I had a huge grin on my face for the most of the day. Finally, after a few hours I reached the border of yet another fascinating state, Michigan. But that’s subject for another story or two. This entry was posted in Uncategorized and tagged Ford Mustang, Green Bay, Green Bay Packers, Harley Davidson, Harley Davidson Museum, Lambeau Field, Milwaukee, Wisconsin, Wisconsin Hwy 55 on November 1, 2011 by admin. It seems like the Green Bay Packers are having excellent season again. 8 wins and no loses so far. Some even predict they can get all the way to the Superbowl and win it again.